A lot of my friends play World of Tanks, and they’ve been inviting to me join their Friday night games for a while. Last night I finally took them up on the offer. It’s surprisingly fun. I thought I wouldn’t enjoy it as much as I did. It reminds me a lot of a first-person shooter (although it’s third-person usually), but you’re in a tank of course. It’s also slower and requires more thoughtfulness and caution than most FPS games I play. There are two teams in every battle, and it appears the goal is either to be the first team to capture the neutral flag or to capture the enemy flag depending on the map. To capture a flag, you simply stay in the circle around the flag. The more tanks in the circle, the fast it captures. It’s possible that there are other modes as well and that I just didn’t play them, but I don’t know. There are tanks from a variety of nations, and each nation has a tech tree. Depending on what you research on a nation’s tier 1 tank, you’ll be able to research and purchase various tier 2 tanks. I chose to focus on US tanks. I researched all the US’s tier 2 tanks – a light tank, medium tank, SPG, and tank destroyer. I’ve purchased all but the SPG. 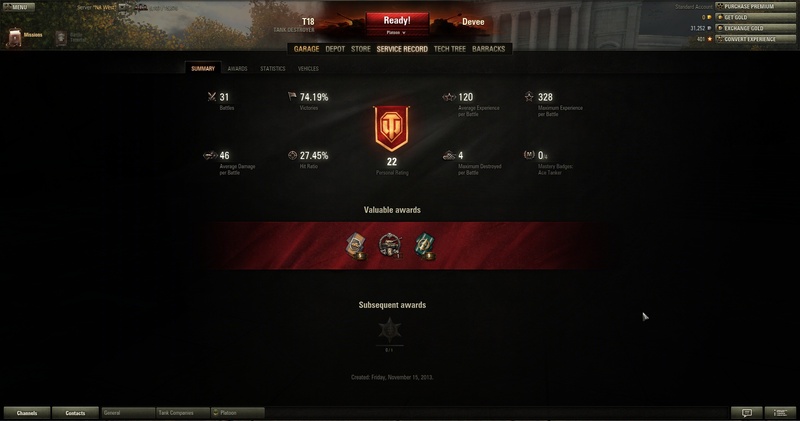 I seemed to have done the best with the tank destroyer, so that’s what I played the most. I researched and bought all the upgrades for it as well. There’s a lot about the game that I haven’t learned yet, but at least I have a strong enough handle on it to play and enjoy the game. I played 31 battles with a victory rate of 74.19%. That was mostly thanks to my friends though!